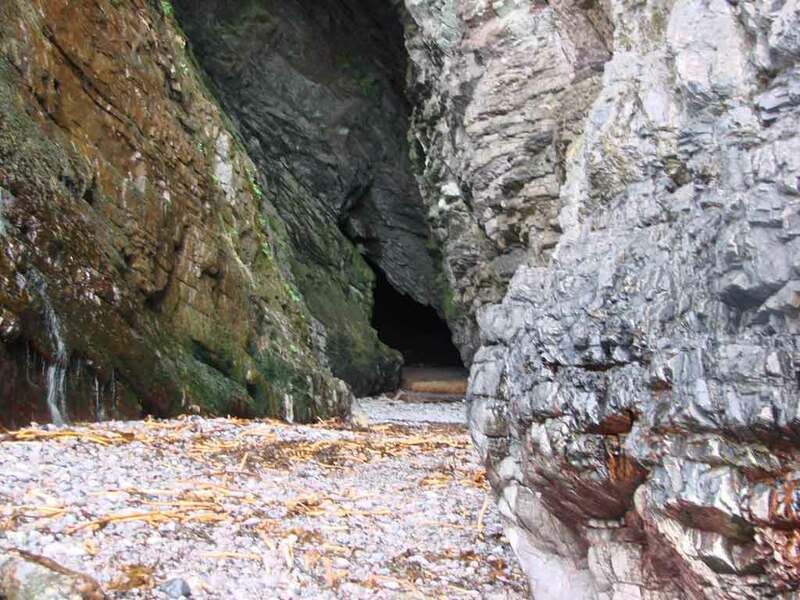 Steeped in myth and magic and with great geological and topographical fascination, the short walk to MacKinnon’s Cave (Grid ref NM 441323) can be a testing scramble over muddy ground and a large boulder beach before the entrance to Abbot MacKinnon’s cave is reached. 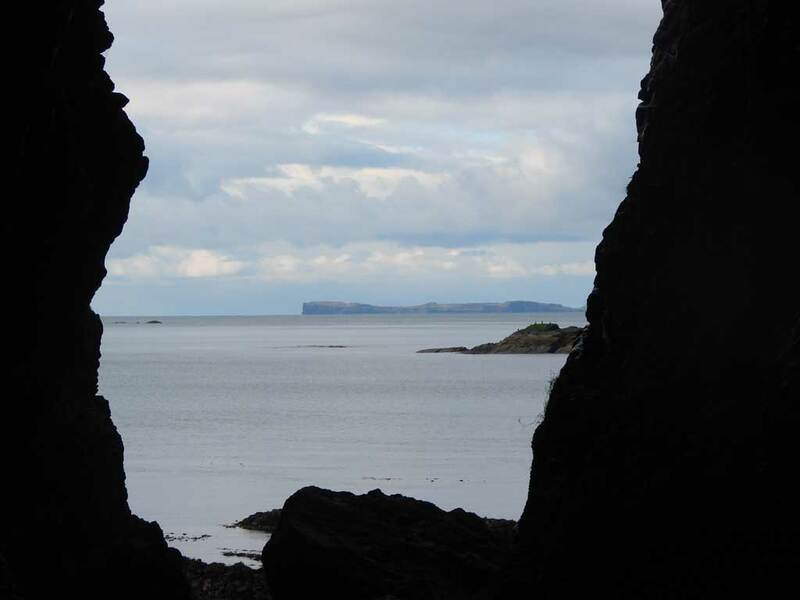 Popular as a place of interest since Dr. Samuel Johnson and James Boswell measured the cave during their tour of the area in 1773, this wet track continues to host many visitors to the Isle of Mull, hoping to sense some of the mystery surrounding this beguiling part of the island. Turn off the B8035 at Gribun and park in the designated area prior to Balmeanach Farm where there is also a map and information board. Continue on foot past the farm buildings and through the marked gate on to a muddy path and follow the fence line before descending on to a boulder beach. From here, it is only a short distance to the cave, but a rough and, potentially, slippery scramble has to be overcome before you arrive at the cave. The coastal scenery along the way is magnificent and leads the walker through a complicated geological stratification spanning over 2,000 million years, from Mull’s largely concealed basement rocks to the more obvious Tertiary lava flows that produce the characteristic stepped landscape seen throughout much of Mull. The views across the mouth of Loch na Keal from the cliff path can be breathtakingly beautiful. On a fine day, it is possible to witness a panorama of islands in a broad sweep of the eye, including the Treshnish Isles archipelago and Staffa, with Coll and Tiree beyond and the holy isle of Iona showing itself to the south-west. 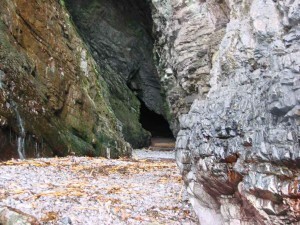 Regarded as being one of the deepest caves in the Hebrides, MacKinnon’s Cave has gathered an aura of it’s own over the centuries since the early Celtic monk. As is befitting such a dark and mysterious place, many fantastic stories about the cave have circulated down through the centuries. Abbot MacKinnon was reputedly concealed there in the 15th Century. 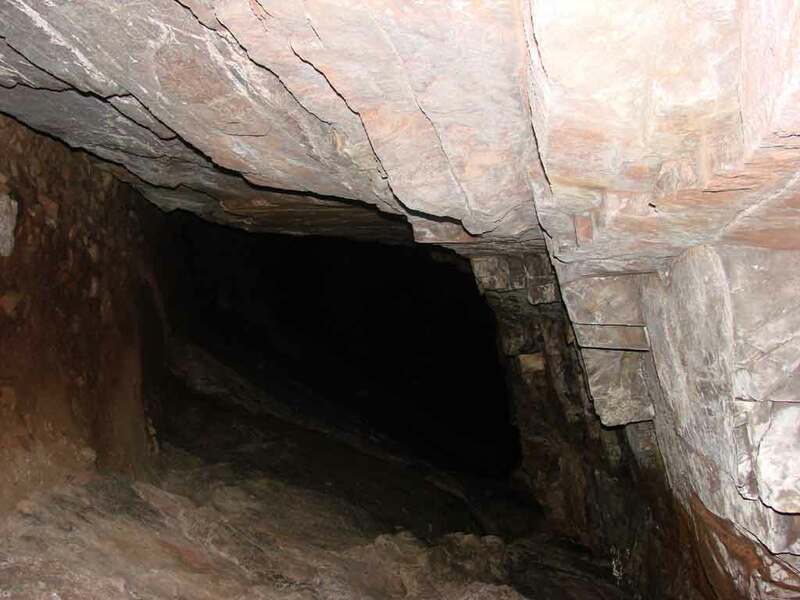 Deep inside the cave lies a large, flat slab of rock, which has come to be known as ‘Fingal’s Table’ and may have been used as an altar by hermits and early followers of the Christian church. There is also the haunting tale of the piper who tried to outdo the fairies in a piping competition and walked into the cave along with his dog. Only the dog returned, crazed with fear and hairless. Some say the piper went right through the hill and emerged on the other side of the headland at Tiroran on Loch Scridain.